Bali Souvenior Shop A gold shop in Sulawesi Street that is selling 21carat, 22carat gold and many kind of gold jewelries in various styles. 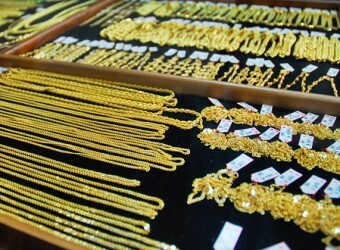 Gold is sold by the gram and prices change daily like the currency exchange rate. In Sulawesi Street you can find an entire street lined with shops selling gold at affordable prices in Indonesia and traditional Bali designs.